Every now and then when working on a program, I like to have a brainstorming session. �Usually I’m just lying comfortably in my bed, thinking of how I can expand a program more, remove bugs, or make it quicker or more stable. �Last night, I had a brainstorming session for tear bookmarks, and I thought I’d share my notes with everyone who reads this. My brainstorming session basically consists of my tablet running xournal. �I get nice lined notebook paper, where I can write down any ideas that pop into my head. �I can then look at that later and go “No… that won’t work” or “Hmm… I might be on to something,” and try to implement it. So, if you’d like to see what I’ve been thinking about for tear bookmarks, look at the following PDF:�2009-04-22-tearbookmarksbrainstorm. �Enjoy! Last night, I relased tearbookmarks 0.3.1-4.� It’s a pretty major update, but I refuse to give it the 1.0 until tear itself is out of beta.� This release includes multiple new features.�� First, the menu load is completely dynamic.� The plugin will first check if the bookmark database has been updated since it last grabbed its information.� If it has, it will update the menu, then display it.� If not, it’ll just show the menu.� Loading the menu items could take a bit of time, but I’ve done the best I could to make it as quick as possible. Second, this release includes the long-awaited folders.� While tear itself doesn’t allow you to manage folders, bongo’s bookmark manager should (in the near future) have this option.� Folders show up at the bottom of the menu, below all your bookmarks, and also load dynamically, so they don’t take time while loading with the main menu. Third, this release includes some better handling of how to open tear.� It removes the overhead needed to launch the tear executable if tear was already running, and is instead now using dbus directly.� It will also show the “Loading…” information box when launching tear for the first time. Finally, this release includes bongo’s bookmark manager, including a shortcut to the bookmark manager in the menu.� This shortcut is placed in the same position as the default bookmark plugin, to mimic the actions of that plugin best. tearbookmarks 0.3.1-4 is available in extras-devel for diablo only.� If you enable extras-devel to install tearbookmarks, please disable it immediately after. mcedit is designed to make editing the system file /etc/mce/mce.ini easier.� It exposes via GUI some interesting configuration options that are normally hidden away.� It is a work in progress, and is not yet feature-complete, and should not be used by most people yet.� I take no responsibility if anything bad happens to your tablet while using this program.� It is my first python programming using all pure python and GTK, no glade file. 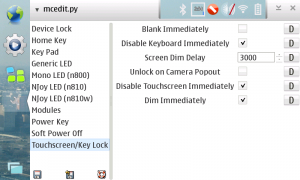 It is available in maemo extras-devel for diablo.� A download link will be provided when mcedit is end-user ready, and in extras.� For now, you’ll just have to live with a screenshot. Since pyRdesktop depends on rdesktop-cli, this post contains information about both.� The reason for two separate packages is twofold: one, so that I can push updates for each application separately; two, so that those who just want the CLI version of rdesktop can get that. pyRdesktop is a new frontend for rdesktop, designed to be optimized to work on the internet tablets.� It features all the basic options, some advanced options, and support for multiple remote desktop profiles (in case you have multiple computers/ip addresses).� On clicking “connect”, it simply runs rdesktop-cli.� While it does not allow full control over what parameters are passed to rdesktop-cli, it gives options for the most popular. rdesktop-cli is, as the name suggests, the command line rdesktop client.� It has some hildonization (which isn’t perfect).� The package is intended to be used in conjunction with pyrdesktop. 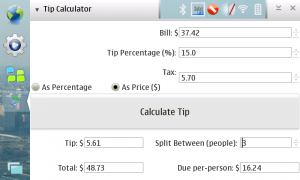 A simple tip calculator written in python and glade, designed for maemo.� Features include support for calculating tip before tax, then adding tax (as a percentage, or a price), and splitting the bill between multiple people. 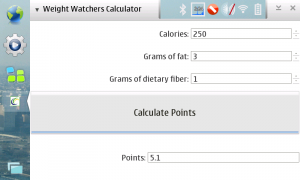 This is a simple calculator for Nokia Internet Tablets to calculate weight watchers points.� Simply input the calories, grams of fat, and dietary fiber in the food, and click “calculate points”.